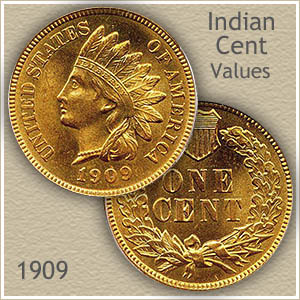 Your 1909 Indian head penny value is significantly higher than most other dates in the series. A valuable coin, in 1909 Indian pennies were ending their years of production and making way for the new Lincoln cent. The number minted is far less than most years creating a fundamentally scarce coin. Next, identify if your coin is the rare "S" mint 1909 penny. San Francisco minted a relatively small number of Indian pennies and their value starts in the hundreds of dollars. Finally, the condition of your coin is very important. Condition has always played a major role in all coin values. However its influence increases with the large jumps in your 1909 Indian head penny value from one grade to the next. If you can easily read "Liberty" across her headband it indicates your coin is in better condition than most and higher value. The rarity and value of the 1909-S Indian head penny not only includes the gem condition coins as expected. Strong demand and high value as a collectible extends also to the heavily worn examples. Its is one of the classic rare US coins collected in all conditions from the well worn to the superb top quality. Two 1909 San Francisco Indian head pennies are pictured. Their range in condition is huge. On the right is a "good" condition coin, worn almost smooth. To the left is an outstanding gem quality "uncirculated" penny, at the very top in condition. After many rising bids the Gem 1909-S sold at David Lawrence rare coin auctions for $3795 and the "Good" condition coin was bid to $557. Demand and scarcity of these coins is clear. 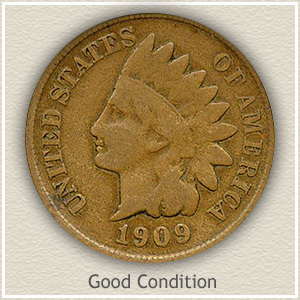 1909 Indian head penny value is supported by a large number of collectors and this coin is considered scarce today. 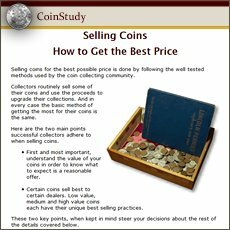 A quick look at the value charts shows the importance of accurately judging the condition your coin. Determining your 1909 penny is just a little nicer than average reflects a big change in value. Judging a coin’s state of preservation is known as "grading" by dealers and collectors. Noticeable features separate the varying degrees of possible wear. 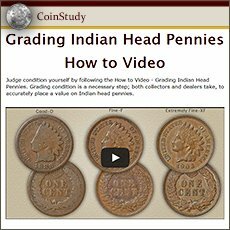 By comparing your coin to the images and determining its grade you can find an accurate Indian head penny value on the chart. 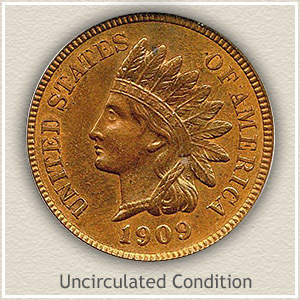 Uncirculated: Rare is a 1909 Indian penny in "uncirculated" condition. It is a coin that has never circulated and there is no wear to its surfaces. To confirm your coin is in this condition examine the very ends of the feathers, if wear is present it smoothes the normal "grain" and flow lines of the metal. Her cheek and extending to include the chin is another area prone to early wear. Again a worn surface shows smoothing to the metal, a distinctly different look compared to the surrounding area. 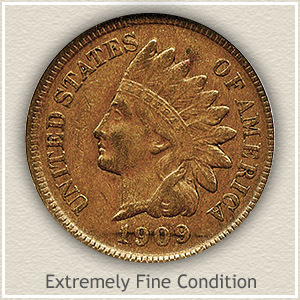 Extremely Fine: Sharply defined details, including the minor elements, defines an Indian penny in "extremely fine" condition. Looking closely at the head band the letters in Liberty are fully separated from the defining lines of the band. Wear is present, however all parts are bold. Your coin should stand out as very pleasing to the eye and highly detailed. 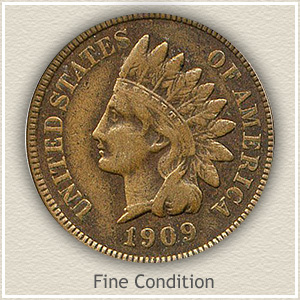 Fine: Collected from circulation with ample detail remaining, 1909 Indian pennies in "fine" condition are valued in the hobby. Her chin and cheek has worn flat, much of the finer detail separating the curls of hair are smoothed into one. The headdress is recognizable with the headband and feathers separated. Overall a bold image remains. Good: Extensive use has worn the majority of this coin away. Most detail separating the feathers, headband, and hairline above her face is smooth and missing. Additionally, her cheek is worn smooth with little or no roundness. Collectors and dealers prefer a full rim if considering a coin as reaching the "good" grade. Even in this well worn condition your 1909 Indian head penny value is still far above most other dates. 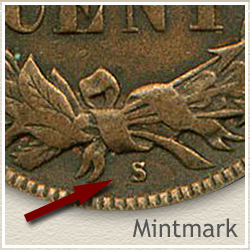 Awaiting discovery is the possible "S" mintmark on the reverse of your 1909 Indian penny. The San Francisco mint busy that year introducing the Lincoln cent did strike a small amount (309,000) Indian pennies. An immediately scarce coin distinguished by the "S" mark on the reverse just above the rim, under the wreath. If without the mark your coin originated at the Philadelphia mint, still highly collectible. 1909 Indian head penny value is far ahead of others minted in the 1900 to 1908 years. A very popular coin, the value of an Indian Head penny is the result of wide spread collector interest. Common dates are now worth one dollar each. Many collections are being assembled with an emphasis on high condition and rarity. Compare your Indian head penny dates to the values chart. Find not only your 1909 Indian head penny value but all dates in the series. Year over year a steady rise in value is recorded. You can determine accurate old US penny values by using the grading images to judge condition then checking the date and values on the charts covering each series of US pennies. Further discovering all the rare varieties, dates and mintmarks. All old US coin values. Use this page as a starting point, it is an excellent index with images and text links to all coin series, from Cents to Gold. Value charts, grading images and descriptions uncover not only the value of Indian pennies but how much your box of old coins is worth. Prepare your coins for selling, find coin buyers and understand their true potential.